Wintertime: My hearth. In fact, anytime: My hearth. Back away slowly and you might be spared. - Tilly, please send our regards to Linda, Delaney and Mike for sending us you photo ;-) Pretty please of course! Could I just ask how slowly is "slowly?" We really want to get this right, and well, someone here is concerned that if we go too slowly, Tilly will get impatient and change her mind about the "sparing us" part. We are actually all petrified and don't want Tilly to get fidgety because we are frozen in place in front of a hearth that is definitely hers year round. Probably best just to never get close to a rabbit at a hearth so the issue of "How Slowly" need not come up. The Tar Pits are warm enough I guess. 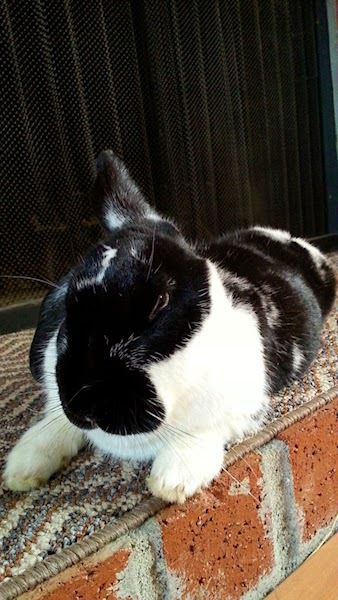 I hope the rest of you rabbit custodians take heed and get yourselves a hearth, the better to satisfy your bunlords. Tilly, looks to me like your hoomins don't even need to procure firewood; the heat from that burning gaze should heat the house just fine.